In tandem with the release of Old Money, New Woman, we’re marking the birthdays of great women in history with a brief note, and enduring appreciation for their contributions. I’ve mentioned novelist and Old Money Gal Edith Wharton in previous posts. She deserves another nod today. Happy Birthday, Ms. Wharton. Born to privilege, Edith Wharton was also born to write, and write she did. She published her first poem at the age of 15, authored more than 85 short stories and 15 novels, and, in 1921, was the first woman to win a Pulitzer Prize for Literature. Her most well-known novels include ‘Age of Innocence’ and ‘House of Mirth’. A child of the Civil War, she was three years old when the Confederate States surrendered. After the war, her family traveled extensively in Europe, enabling her to become fluent in French, German, and Italian. She rejected the standards of fashion and etiquette that were expected of young girls at the time, considering these fashions superficial and oppressive. Ms. Wharton also wanted more education than she received, so she read voraciously from her father’s library and borrowed—sometimes without permission—from the libraries of her father’s friends. On vacation in Paris when World War I broke out, Ms. Wharton didn’t flee to safety like most everyone else. She stayed and offered assistance to unemployed French women and refugees, held fundraisers for the war effort, and opened tuberculosis hospitals. She was made a Chevalier of the Legion of Honor by the French president for her efforts. It wasn’t because she played it safe. 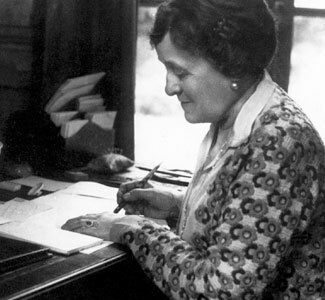 If you have a passion for writing, read about the life of Edith Wharton. …”and the glory of Europe is extinguished forever”. Great quote, which nota bene was Burke’s lament over the imprisonment of Marie Antoinette during the French Revolution. I first read it in a book by Harvey Mansfield. Thank you for mentioning Edith Wharton! An inspirational woman. Admirable how she used her communication skills for a higher purpose. Not to mention her noble philanthropic causes. I’m adding House of Mirth and Age of Innocence to my Amazon reading list. Have a great Wednesday Byron! Although the word “decoration” is today frowned upon by architects, I find it quite remarkable that she also co-authored a book on the subject, and co-designed one of her houses. Old money architects don’t seem to be very common. I recently looked for works of a contemporary Bostonian architect, family of one of Wharton’s friends. But all I could find was a marriage notification in the NYT, and a case involving a real estate transaction on Beacon Hill. The level of discretion says enough.